The nineteenth century saw repeated panics about sane individuals being locked away in lunatic asylums. With the rise of the ‘mad-doctor’ profession, English liberty seemed to be threatened by a new generation of medical men willing to incarcerate difficult family members in return for the high fees paid by an unscrupulous spouse or friend. Sarah Wise’s book uncovers twelve shocking stories, untold for over a century and reveals the darker side of the Victorian upper and middle classes – their sexuality, fears of inherited madness, financial greed and fraudulence – and chillingly evokes the black motives at the heart of the phenomenon of the ‘inconvenient person’. Below, Jennifer Wallis tells us how this book has been an inspiration to her in her work, including the historical study of “the body” and how it links to the mind. The history of psychiatry has proved a rapidly expanding field in recent years, with a number of historians seeking to uncover the everyday experiences of patients, staff, and families. Often this work involves studies of large asylum populations that have sometimes overturned our assumptions about insanity in the past (such as the idea that women were wrongfully committed by conniving husbands in large numbers). Yet, when looking at the demographic features of asylum populations, it’s often easy to forget the personal experiences at the heart of this history. It is these personal experiences that Sarah Wise’s book seeks to uncover. Focusing on the nineteenth century, the stories she presents are often heart-breaking, sometimes funny and always poignant. Closing her final chapter is a photograph of Georgina Weldon, a prominent campaigner against lunacy laws, on her deathbed – a portrait commissioned by Georgina herself and posed before death. Though Georgina successfully thwarted attempts to have her committed to an asylum, the picture is a graphic reminder of the real person hidden within the archive, a powerful way of connecting both the reader and the historian with their historical subject as an individual: we all ‘have’ or ‘are’ a body. Bodies are, perhaps unsurprisingly, less present in histories of psychiatry than in other areas of the history of medicine, yet in the late nineteenth century bodies and minds were beginning to be increasingly linked. Cerebral localisation work, for example, mapped bodily movements onto specific areas of the brain. Studying these historical bodies and how they interacted with medical practices is a useful way of exploring both the development of ideas about mental illness and the work that was done within asylums to ‘know’ the patient and their illness. Within the asylum casebook records that I consulted for my PhD on late nineteenth-century asylum practice, the physical body of the patient was often painfully present. William C., admitted to the West Riding Asylum in 1900, was reported to be ‘talking all kinds of nonsense’ and behaving violently towards asylum staff. Also recorded in the casebook was William’s own account of a seizure, whilst details of his previous medical care were supplied by his brother. Alongside these personal narratives were other narratives produced by bodies, medical technologies and asylum practices. Patients were photographed, their image pasted into their casebook record. The ophthalmoscope was employed to examine the eye, with any anomalies seen in the vessels thought to reveal something of the state of the brain. 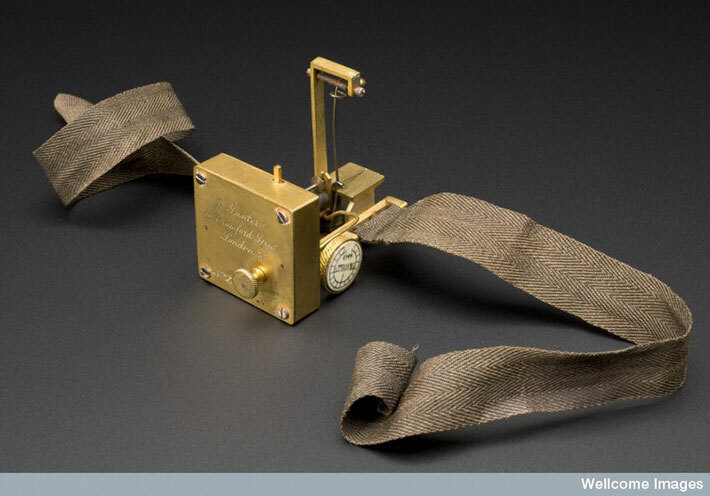 The sphygmograph, an instrument to chart the pulse, might be utilised, with the smoked paper tracings that it produced added to the case record. If a patient died in the asylum, and post-mortem hadn’t been objected to by friends or family, these investigations continued: tissues were examined under the microscope and the appearance of the body’s interior meticulously described. Despite this array of practices, the subjective experiences of the patient were not simply erased by an increasingly ‘anatomically-based’ medicine. In many ways the patient was an active participant within evolving psychiatric discourse, with their life stories, hallucinations, or responses to physical examination informing broader theories about mental illness. The often literal fragmentation of the patient’s body may make us uneasy, but did not necessarily mean that it was considered unworthy of therapeutic attention. Sphygmographic traces, for example, raised the possibility of pharmaceutical interventions that might act upon the veins to regulate the pulse. My own work has considered how, by focusing on discrete parts of the body, we can illuminate broader historical issues, such as conceptions of mental health. Individual stories like those recounted by Wise are a vital element in histories of psychiatry. Whilst teaching a course on the topic, undergraduate students told me they found these stories easier to ‘think with’; the individual story contained within a case record raised questions and inspired discussion, but also brought home that these were very real people, leading very real lives, and not simply numbers within a table. Jennifer Wallis is a Postdoctoral Research Assistant at the University of Oxford, where she is currently working on the therapeutic uses of air in the nineteenth century.